for all ages open now! Click here to see trail conditions. Click here to see trail descriptions for our over 15 miles of incredible mountain biking trails. DISCLAIMER: Take trails at your own risk. Know your skill level and ride well within it. Click here for an explanation of our trail rating system. Stay informed about our mountain bike trails and hiking trails by filling out the form below! Ridden the trails? Tell us what you thought! The grand opening for our mountain bike trails will be on April 13 and 14, during our mountain bike festival called "Dirt Church." We now have over 15 miles of world-class mountain biking trails! Over 15 miles of mountain bike trail awaits you on the grounds of the almost 700-acre property of The Great Passion Play. The Great Passion Play is excited to announce the completion of the first phase of construction hiking and mountain biking trails on the Passion Play grounds. Renowned mountain bike and recreational trail builder Tony Boone and his crew completed building the first 5-mile loop of what is planned to be over 18 miles of trails on the almost 700-acre complex of the Great Passion Play in Eureka Springs, Arkansas. loop is all that is on the docket to be completed before summer. “It’s a big project and the dip in temperatures made it a pretty slow start. Our plan is to finish this 5-mile trail and then come back during the last quarter of 2018 to complete the rest with the hopeful completion date sometime in 2019. People are really going to enjoy using our stacked loop trail system." This trail was specifically designed to meet the specifications to host NICA mountain bike association races. Kyla Templeton, the Director of the Arkansas NICA high school mountain bike racing league, visited the flag marked trail this past week and planning is beginning for the first race. The Great Passion Play’s performance season runs from the first Friday in May until the last weekend of October with year-round attractions including the Christ of the Ozarks, Holy Land Tour, hiking and nature trails, Noah’s Ark Park Petting Zoo, Bible Museum, Berlin Wall Section, Church in the Grove, and gift shops. 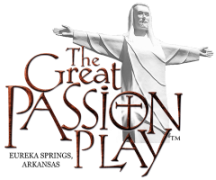 For reservations, performance schedules, volunteer opportunities, or special event information, go to GreatPassionPlay.org or call toll free 800-882-7529. Join the 7.8 million who have seen “The Greatest Story Ever Told” at The Great Passion Play in Eureka Springs, Arkansas.